1 pair of brake shoes for one wheel - for leleu wheel hubs. fits on puch five stars, puch spoked rims, and most peugeot 103 and motobecane spoked rims n wheels. fits on honda hobbit rear brakes too ! fits on some solex rear wheels too! If in doubt check it and do some research!!!!! magik stopping powers. hi quality. low price. 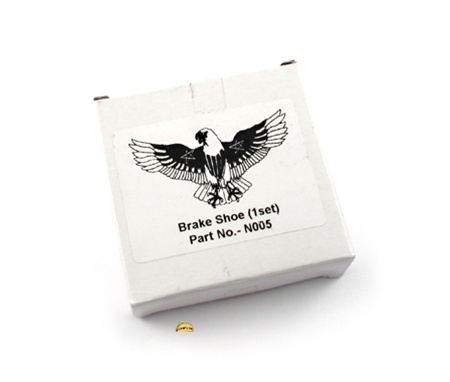 magik eagle power 80mm x 18mm - always measure to be sure you're getting the right brakes! Fits Puch Maxi with Leleu rims. Once they worn in properly, they were great. Had to lock the front brake auto-adjust thingy in place with a screw. It tends to let the shoes ride the drum too hard. Better and cheaper than EBR's. Servicing a Maxi for my neighbor. Brakes were all but gone. Tossed in a set of these puppies... damn! what an upgrade haha! 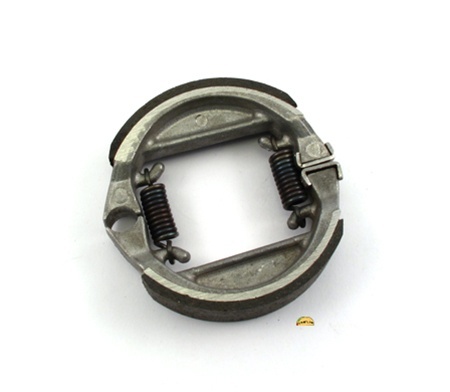 The only "issue" i had was one of the shoes had a bit too thick a layer of material and wouldnt allow the brake plate to slide back into the hub. Great for the price! No problem installing on my puck maxi great stopping power.